7 Bridges www.7-bridges.org is an ambitious project to regenerate Loughborough Junction – the creation of Walter Reed, a local film-maker and architectural project manager. 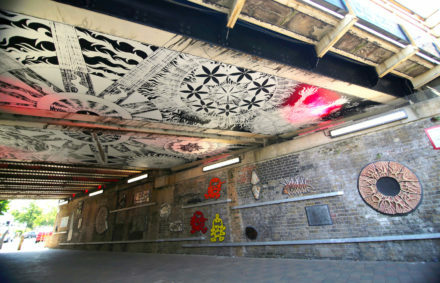 It is an art led regeneration project focusing on improving the appearance of Loughborough Junction’s many railway bridges through art installations, colour, light and community engagement. The vision is that 7 bridges will define Loughborough Junction and create a strong and lasting sense of place to build identity and pride in Loughborough Junction. 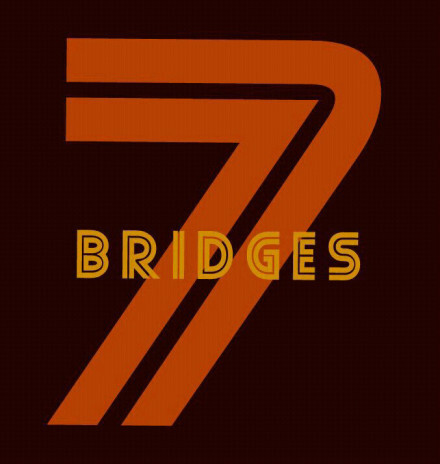 To date the first of seven bridges on Cambria Road has been completed and the result reflects the energy ploughed in by the 7 bridges team – artwork which will stand the test of time. The development of this one bridge has provided a space for locals to enjoy street parties, public realm improvements on Cambria Road, a free augmented reality app, films and songs about Loughborough Junction. The Cambria Road bridge was completed first as a pilot bridge to learn lessons on how to complete the remaining 6 bridges. 4 years later the Cambria Road bridge was completed. Complications made this project labour intensive and time consuming. Undeterred Walter is determined to see the project through to completion, backed by locals and artists with a vision for a better Loughborough Junction. There are six bridges left to complete. Walter together with a group of volunteers are seeking funding for the remaining bridges.